Perfect for pots, hanging baskets and grow bags to encourage vibrant flowers and healthy fruit and veg. 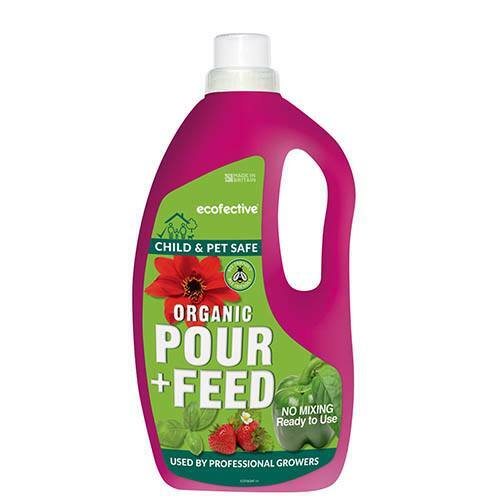 Child, pet and bee safe, ecofective Organic Pour and Feed is a high quality natural based feed, with the added bonus of DELTA+, which contains bio-stimulants to increase nutrient uptake by the plant. A universal feed for both indoors and outdoors plants, this formula is perfect to use under cover to include pepper, chilli and herb plants, promoting strong, healthy fruit and vegetables and encourages abundant, vibrant flowers. If your compost is too dry before feeding it will simply run through. It’s best to water your plants about 5-10 minutes before applying the feed. During the growing season it is always a good idea to soak your pots and baskets through once with water to reduce the salt build up that may have occurred. Supplied as a 1.5L bottle. For feeding a wide range of fruit, vegetables, flowers, shrubs both indoors and under glass, as well as pots, hanging baskets, indoor grown capsicums (chillies, peppers) and herbs. Water plants and then apply one capful of feed to the base of the plants, avoiding the foliage. Apply every 7 days during the growing season.